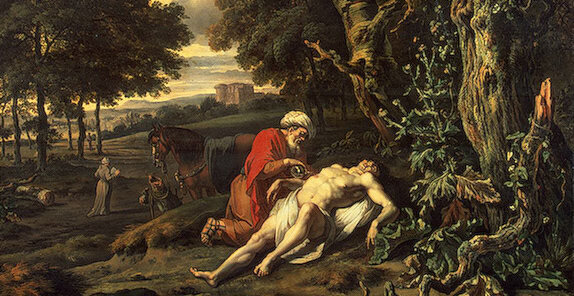 Those who attend the Ordinary Form of the Mass will hear the parable of the Good Samaritan from St. Luke’s Gospel this weekend. Often homilies on these famous verses touch upon the nature of Christian charity and a deeper understanding of neighbor. What has unfortunately been lost in many contemporary interpretations is the allegorical understanding of the parable. Below is a explanation of the parable from the Venerable Bede. An 8th century English monk of the monastery of St. Peter in Northumbria and a Doctor of the Church, Saint Bede provides us with an allegorical reading of the parable…one firmly grounded in the Church and salvation history. The man who went down from Jerusalem to Jericho is Adam representing the human race. Jerusalem is the city of heavenly peace, of that happiness from which he has been separated by sin. The robbers are the devil and his angels, into whose hands Adam fell, because he went down. They stripped him and robbed him of the glory of immortality and the robe of innocence. The injuries they inflicted upon him are sins which, violating the integrity of human nature, let death in through half open wounds. They left him half dead because they deprived him of the blessedness of eternal life, although they could not abolish in him the faculty of reason by which he knew God. The priest and the Levite who saw the wounded man and passed by denote the priests and ministers of the Old Testament who could only show up the wounds of the sick world by the decrees of the law, but could not cure them because, as the apostle says, it was impossible for them to wash away sin with the blood of calves and lambs. The two pence are the two Testaments bearing the name and image of the eternal King. Christ is the fulfilment of the Law. The two coins were given the next day to the innkeeper, because on the morrow of His resurrection, our Lord opened the eyes of the two disciples of Emmaus and of His apostles, that they might understand the Holy Scriptures. For on that next day the innkeeper received the two pence as a reward for his care of the wounded man, because the Holy Ghost descending upon the Church, taught the apostles all truth, that they in their turn, might be able to teach all nations and preach the Gospel. An earlier version of this article was posted on August 11, 2013. Posted on July 9, 2016, in liturgy and tagged allegorical, fifteenth Sunday ordinary time, good samaritan, gospel reading, parable, venerable bede. Bookmark the permalink. 3 Comments. This can be found in St. Augustine too, and a reference to it can be found in St. Irenaeus. It’s a very ancient interpretation. We heard our great Priest break down this parable and it blew our mind. We are glad we found it on the Liturgy Guy’s blog. Please share because it shows how important the Catholic Church is for our salvation.